Q: Why should I use the das Curb Marker? A: Durability, appearance, convenience, and safety. 1. Many companies locate and mark facilities with paint. das Markers make re-marking unnecessary for years. 2. das Curb Markers present a uniform and neat public appearance and eliminate “graffiti” complaints. 3. das Curb Markers are environmentally friendly. Paint runoff can contribute to non-point source pollution. 4. das Curb Markers help to prevent damage to equipment by alerting potential excavators to the presence and location of buried equipment. 5. das Curb Markers aid in location for routine maintenance, construction and emergency access in areas where above-ground markers cannot be used. Q: What makes the das Curb Marker special? A: Proven performance since 1983. Our own test data, independent test data, and the experience of having over 10 million of our markers in service throughout the U.S. and seven other countries, means our marking system is the most thoroughly tested one available. We’re happy to provide referrals so that you can talk to our customers. We employ proprietary materials and manufacturing processes available only with our unique marking system. Our markers are less expensive than metals, ceramic, or thermal plastic, won’t crack and crumble (ceramic), won’t bend exposing sharp edges (aluminum), won’t tarnish (brass), and have no scrap value (aluminum, steel and brass). Only das offers three different styles of marker. Every das Curb Marker is imprinted with a lot number for quality control and comes with a 12 year Manufacturer’s Warranty. Q: How long will they last? A: There is no simple answer. Our markers are used on roads in Virginia, curb faces in Minnesota, and sidewalks in Florida. UV degradation and abrasion (chemical and mechanical) influence longevity. Our Standard Style marker is extremely UV fade resistant but may become marred and worn from abrasion. Our Economark Style marker offers a greater degree of abrasion resistance but is much less UV resistant. For the maximum longevity, our Duracast Style marker offers both increased UV and abrasion resistance. The das Curb Marker Adhesive will remain resilient for years, forming a permanent bond with the marker and application surface. A hammer and chisel would be required to remove the marker. Given the variety of factors that influence longevity, we suggest that you contact das, so that we can recommend the appropriate Style marker and adhesive combination for your specific application. Q: Can they be customized? A: The das Curb Marker can be manufactured in just about any size, shape or color. Reflective or non-reflective, consecutively numbered, or bar-coded; with anything from simple text to four-color process graphics are available. We’ve produced bilingual markers and markers employing five other languages (it’s necessary to provide das with the required text as translations can vary by region). We also offer free design service! Provide us with your ideas, text, logo, etc. and we’ll send you a proof, normally within a couple of days. Q: How do I get a quote or place an order for Stock Items? Options: Reflective or Non-Reflective, No-Slip Finish and Numbering, if Available. A quote can be faxed or emailed within 24 hours. Orders can be emailed, faxed or phoned in. Representatives will be happy to take your order over the phone and help you through the process. Q. How do I get a quote or place an order for Custom Markers? Options: Adhesive Guide, No Slip Finish, Reflective or Non-Reflective, Numbering. Stick It & Mark It Permanently! Since 1983 the das Curb Marker has been used successfully by customers nationally and internationally. das Curb Markers can be easily installed on most flat surfaces such as concrete, asphalt and metal. Custom das Curb Markers can be made in just about any size, shape or color with virtually any message or language. All Custom markers are available in Economark, Standard or Duracast Style. Options such as No-Slip finish, Reflective or Non-Reflective, Numbering, Bar-Coding, to name a few, are available. 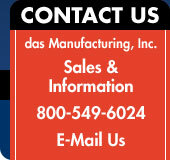 © 2009, das Manufacturing, Inc. All rights reserved.